I am still stitching on the flowers for Mom & Me. Hope to have it finished this week-end. But this week I got a bit sidetracked. My DH brought this find to me this week. He found it in the basement; I think it must have been in the tools and craft drawers from my uncle. It must have been a pin at one time but the pin-back is missing. 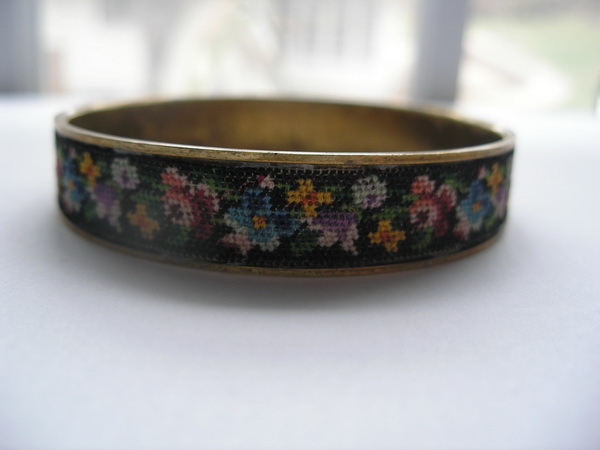 I also have a bracelet similar to this that my uncle gave me several years ago. 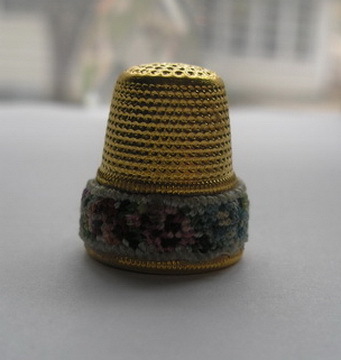 And I also have 2-3 thimbles with this petit point. I tried researching these but the best I could find is that they were made in the 1940-50 in West Germany or Austria. None of mine has a marking that I can see but all are backed in brass. Doesn’t matter, I like them and just wish I knew more about them. Anyone out there who knows about this jewelry I would love to hear from you. Hummmmm, do I feel another collection blooming? And I worked more on my Values of Gray study. I have all the written work completed; I have begun to make computer pages of my samples and I have my paint samples made. 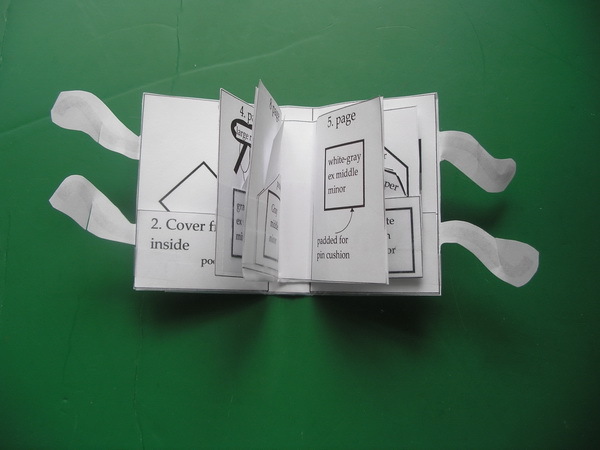 I haven’t decided if I am just going to market the book with designs or whether to teach it online and share my samples too. All my stitched samples are completed (well except for the big project I want to do) and I have had this idea in my head ever since I saw Kurdy Biggs sewing wallet (http://www.threedles.com/06012011/2013/Pangea/Pangea_BagAndWallet.html)….I loved it! And while I was stitching the samples for Shades of Gray I decided to make my own sewing book (but that isn’t the big project). So I have been mulling around my ideas…the other night at 2 AM an idea came to me. Just as a thought…does everyone get these spurts of inspiration at odd hours or is it just me? These creative outbursts really cut into my sleep and I had to get up to draw a rough sketch of the ideas. Next morning I drew them on the computer and then made up this small paper mock up. 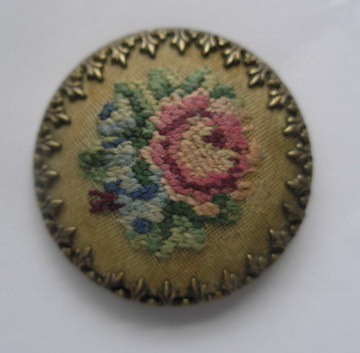 Now I am measuring needlework and thinking about how to construct the book. Any suggestions for sources of books or online helps would be appreciated. I have already decided to make a muslin prototype and think I’ll start this soon. Today is opening day for the KC Royals so I see baseball and stitching in my afternoon plan. Life is hectic and cold in the Midwest right now. We have been 12 days in subzero temperatures…Alaska has sometimes been warmer. BUT today we are supposed to reach a whopping 32 degrees…a heat wave is coming! 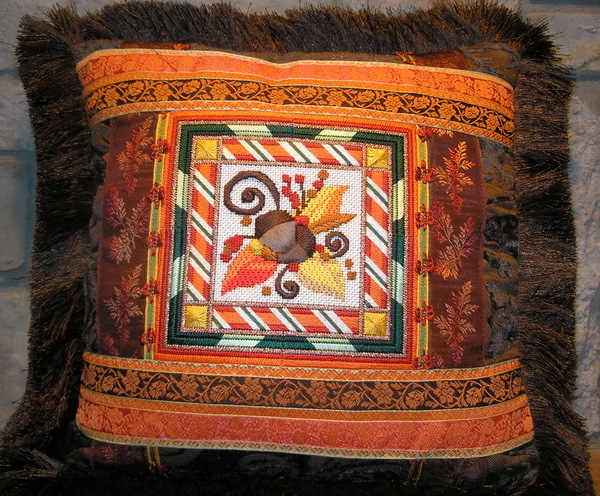 I sent the canvas last fall to Chaparral Needlepoint (http://www.ndlpt.com/) to have them finish into a pillow using ribbons…I just love the way they incorporate ribbons into their finishing…And it was worth the wait. The finishing is absolutely stunning…and it makes my stitching look even better. 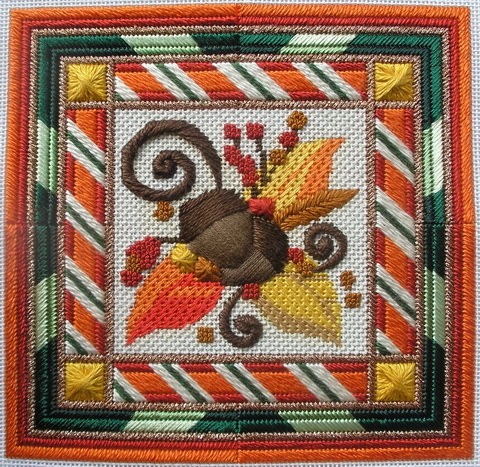 I incorporated padded acorns with 7 or 8 different stitches and using Vineyard silk, Rainbow Gallery Splendor, Elegance and Neon Ray, Kreinik braid, and floss and pearl cotton threads. I have a four page stitch guide to go with this if anyone is interested; email me for the details. (Email address is located on upper right column of this blog) I know I am sounding like a broken record but I hope know that I have three things to put on the web site and husband is retired this is my year for a website otherwise may just have to add a page to WordPress and go for it myself. 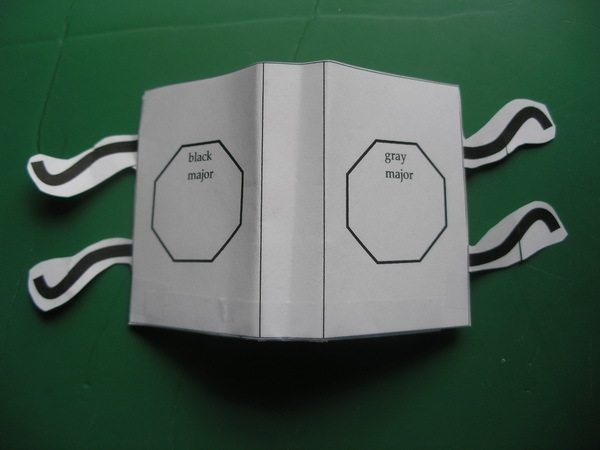 I am still working on Shades of Gray. I have given it to a friend to look over and give me some feedback. And I still have a few things I like to do in this area but the study of color and design is an ongoing thing and so you may hear about it for some time. I’m also thinking about an online course where we could share out ideas…any suggestions? I also promised to re-write my instructions on how to use my graphics and layout program, Canvas from ADSee (http://www.acdsee.com/). I wrote the first one in 1991 using Canvas version 3. So much has changed over the years and even though I do not use all the capabilities of the program I am comfortable in the program and get the job done. I have obtained permission to capture screen images and so I am researching Canvas 15 to write again. I know there will be a limited market for these instructions but I feel like it is important to share my limited knowledge with others who want to do this. Sharing our knowledge and love of something is so important…our legacy; if we don’t share what we know, our knowledge will die. There are several examples of this…look at the art of Temari…up until 5 years ago few people had ever heard of this old oriental art form. Barbara Suess (http://www.japanesetemari.com/index.html) and Ginny Thompson (http://www.temarikai.com/) have been very instrumental in spreading the word and knowledge of this old art form and it is gaining importance again in the needlearts. 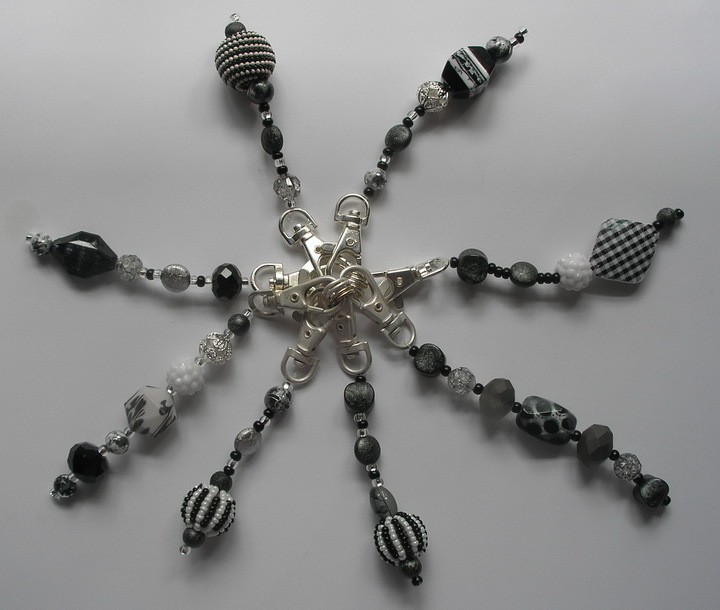 A couple weeks ago in Plays with Needles Blog, (http://plays-with-needles.blogspot.com/2014/01/bead-chains-of-1830s.html), Susan wrote about another almost lost needleart…bead weaving. These are beautiful works of art and we should preserve and pass on the art form. The American Needlepoint Guild (http://www.needlepoint.org/index.php) in its purpose states: ANG is an educational, non-profit organization whose purpose is educational and cultural development through participation in and encouragement of interest in the art of needlepoint. We can only do this if we share. When I started this entry for my blog I was just going to share my first finish of the year but as I started to write this entry a theme started to develop and I realized that this is my goal for the year…sharing. 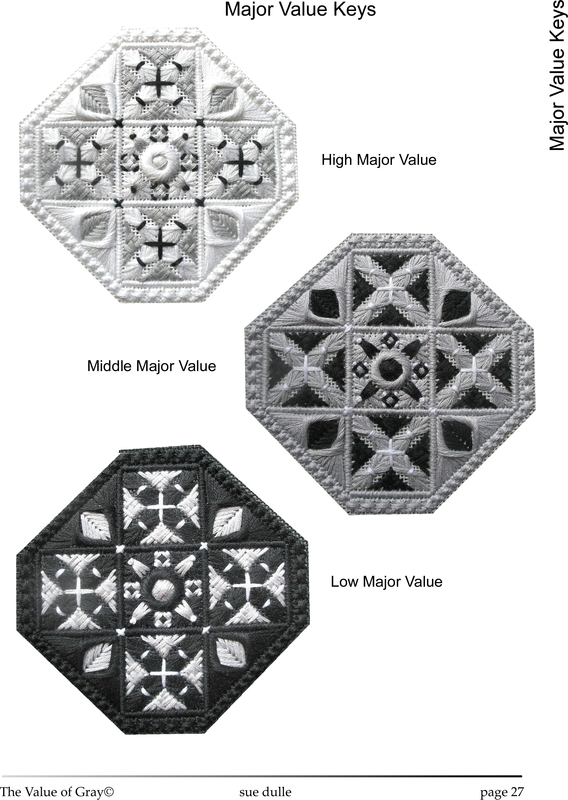 Sharing through writing this blog… sharing my limited knowledge with my friends at guild meetings and stitch-ins… and yes, maybe even teaching someone younger about needlepoint or at least some form of needleart. Welcome to 2014…I know the month is over half gone but for the first 14 days of this year I had the flu…and last week I spent regaining some of my stamina and avoiding being out (doctor’s orders…not because I was still contagious but because my immune system is low.) So for all you who are reading this blog and have not had your flu shot…STOP reading this blog and head for the closest place to get a flu shot. I kid you not this thing is a hum dinger and I still feel sketchy and am not working with all cylinders firing. This was my office, my cat and this chair have been my best friend for three weeks and I am getting so used to this I may hate to move back to the office. But if I don’t get back in the office soon there may not be room for me and the computer…I already have two desks full of work, not to mention I have not taken stitch the first two weeks of this year. Last week, I didn’t actually needlepoint stitch but I did finish (hand stitching) a take-a-long project I had stitched last year. Remember Nick and Walter from last year (https://sudukc.wordpress.com/2013/02/12/laissez-les-bons-temps-roule/)? I mentioned I would love to have Val and as we fellow needlepoint lovers know, there is always someone willing to share. 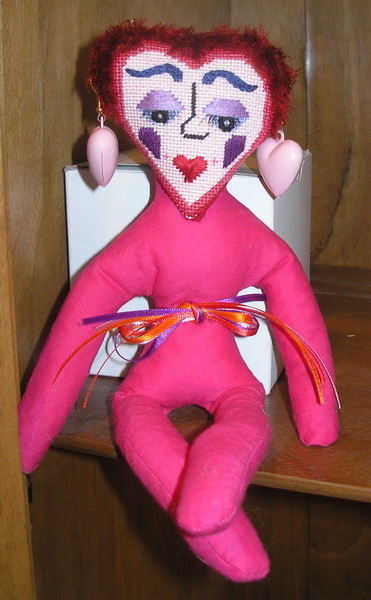 I received a lovely email from a fellow stitcher who was willing to send me an extra Val from her stash. Val is a Kathy Meyer Design (http://kathymeyer1.tripod.com/kmdesigns/index.html), a Gaughi doll. 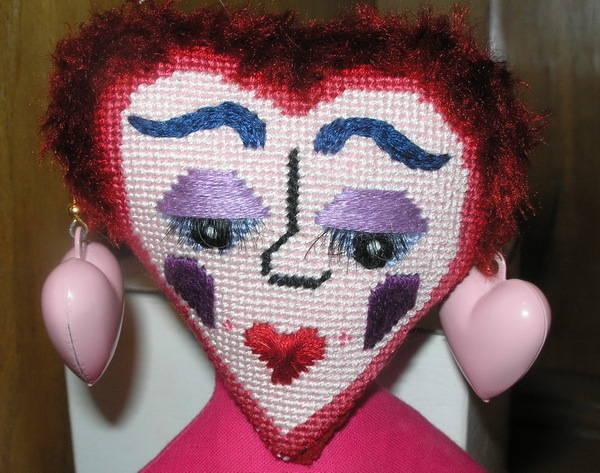 I don’t think Kathy is designing anymore as I could not get her to respond to my email last year but I do like these dolls…I think they are just fun. I took Val on our trip to SD and did most of the stitching and finished up the eyes, lashes and eyelids when I got home. Then I set her aside to finish in my spare time. Out of sight, out of mind…and then last week I realized Valentine’s Day was fast approaching and I better get Val ready for her big debut. I got her body out and opened up her neck to give her some backbone structure; then I finished her head and attached it to her body. Added a pair of heart earrings just for kicks and…Val is ready to make her sweet debut for her special day and I have my first finish of 2014. 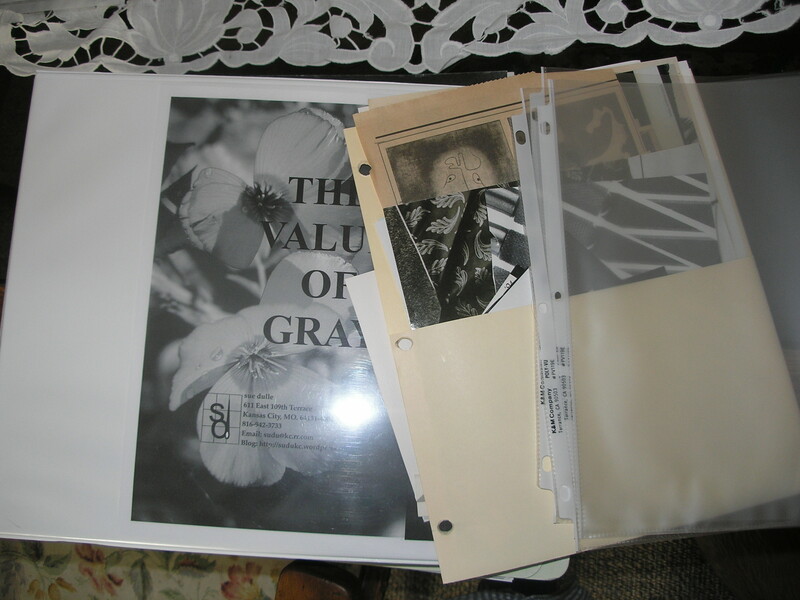 I am still trying to finish the stitching instructions for my Values of Gray booklet. Before the holidays I had more than 8 pieces stitched and had made extensive notes but had not written the stitching instructions. Needless to say, even with my extensive notes, these instructions are slow in coming; it feels almost like artist block. And I still have one more piece I would like to stitch for this project. And I am trying to clear the cobwebs out of my head so I can write some instructions on how I use Canvas to write my instructions for my work and the work I do for others. Before the holidays I upgraded my version to Canvas 15 and received permission to copy screens so I can use them in my instructions. More about this later. So this blog pretty much catches everyone up; the flu has a way of slowing production down , but least I have one blog entry made for this month. Thank you for stopping by and I hope you have time to stitch today! Stitch for me too…still have not taken a needlepoint stitch this year…just don’t feel like it nor have the desire and it is driving me nuts. 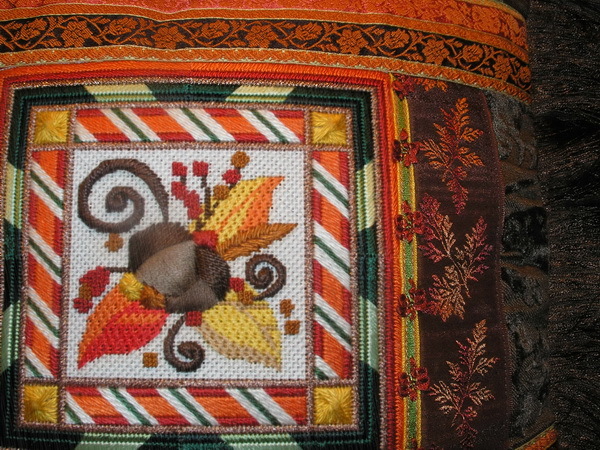 I just finished Raymond Crawford’s Acorn piece it was fun to stitch. I had a slow start with it but then all of a sudden the stitches and threads just spoke to me and I was off and stitching, I felt padded the lower part of the acorns and stitch padded the tops. I really like the curly things and I thought it was fun to experiment doing Shaped Crescent stitches. 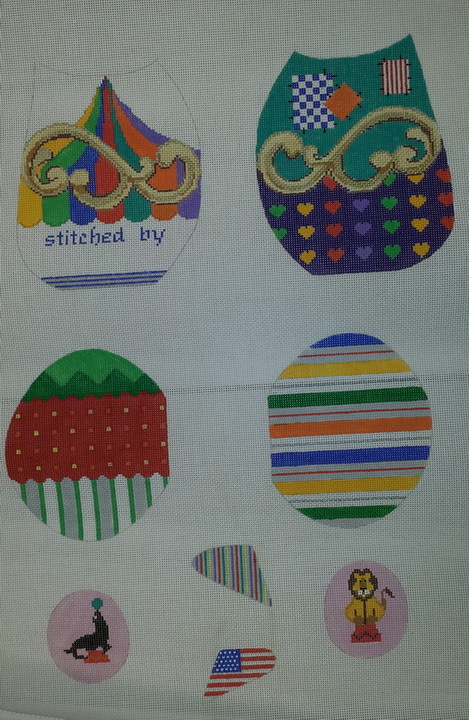 I got my inspiration for these stitches from Jean Hilton’s book, Stimulating Stitches. I think you can still get it from Stitcher’s Paradise (http://www.stitchers-paradise.com/index.htm). I think the hardest things on the piece were the green border areas and that was because I used Rainbow Gallery Neon Rays and laid both front and back…pain in the backside but oh so beautiful. Now it off to the finisher and then I’ll post a picture even though it is next years fall decoration. I sent a copy of the stitch guide to Raymond and was thrilled that he posted a picture on his Facebook page (https://www.facebook.com/pages/Raymond-Crawford-Designs/190891389362) . 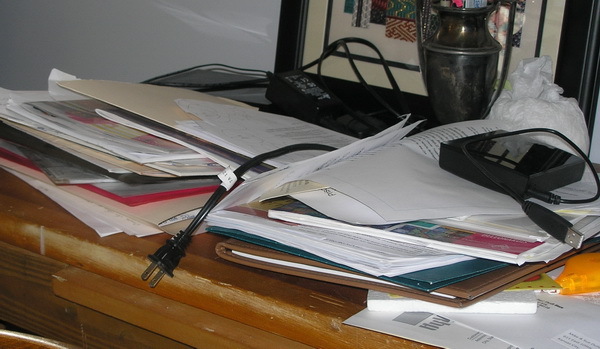 But now it is back to reality…my desk is a mess and I did something I don’t ever think I’ve done before….I sent a designer back her finished instructions and they were not completed. She had given me another design to do and I went for it; just completely blocked out the fact that the other was not finished. 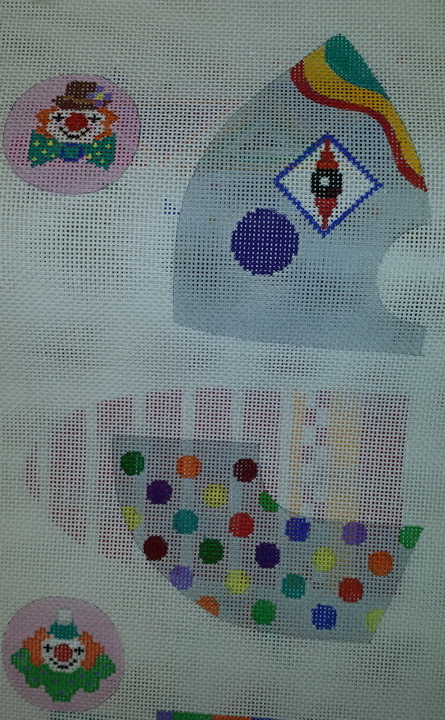 I hope to finish this new one today and send it to her and get the other to complete. And yes I am still working on My Value of Gray book. Since it is technically a color/design book there is more than just stitching to this, but I wanted some stitching to be included because I think stitchers like stitching…I know I do. I’ve been trying to keep the projects small so anyone wanting to try these could have ornaments or small projects to just take along. And before I forget this too…a lovely lady, Norma Gamble from my local guild downsized her stash and trust me it was a substantial down-size and I’m sure she still has plenty to keep her fingers busy. Anyway in this stash reduction were about 5 to 6 good sized canvases for a 3 dimensional piece. Our local finisher, Pat concluded that she thought this was a 3D circus elephant but we are not sure who painted it; it’s only identifying mark is the 309 on one of the canvases. The GKCNG has decided to use it as one of our philanthropic projects. We will stitch it, finish it, have a case made to donate as an art display piece to either to a local Ronald McDonald home or one of the two children’s hospitals here. The guild would like to know the designer and maybe there is a picture available for finishing…Does anyone recognize any of these pieces and if so who do you think was the designer. The GKCNG thanks you for your assistance. And now I need to straighten up my desk before it swallows me up computer and all. I think I am becoming a juggler…I have four different projects in varying degrees of completion and a zillion roaming around my brain clogging up the work some days. 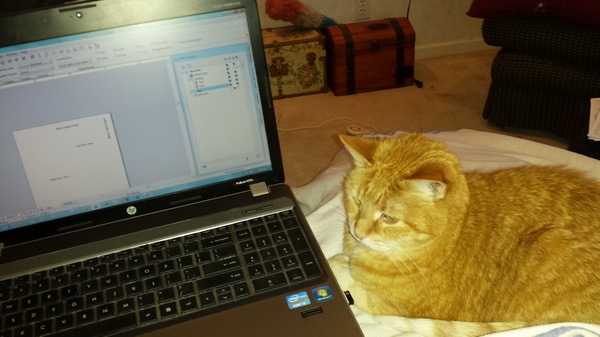 I would love to blog about all but just do not seem to have enough hours in my day to get done what I need to do. The last couple weeks I played around with the value scales and came up with seven different ones. I finished them and even made scissor fobs to go with them until I decided that was not really what I was going to do with them…still not sure what I am going to do with all of them but for right now the value scales are going in my Values of Gray notebook. Anchor Floss: #1, 397, 234, 398, 399, 235, 400, 236, 403. 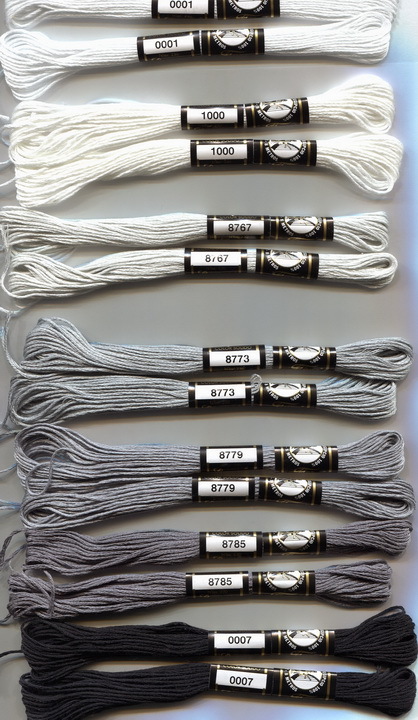 DMC Floss: #blanc, 762, 415, 318, 414, 317, 413, 310. Finca Floss A: 0001, 8767, 8773, 8779, 8785, 8705, 0007. Finca Floss B: 0001, 8688, 8898, 8779, 8785, 8705, 0007. 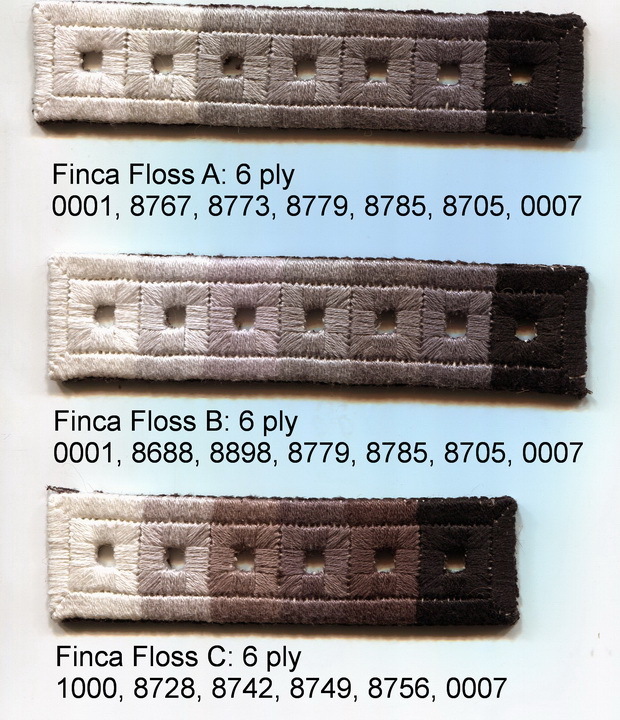 Finca Floss C: 1000, 8728, 8742, 8749, 8756, 0007. 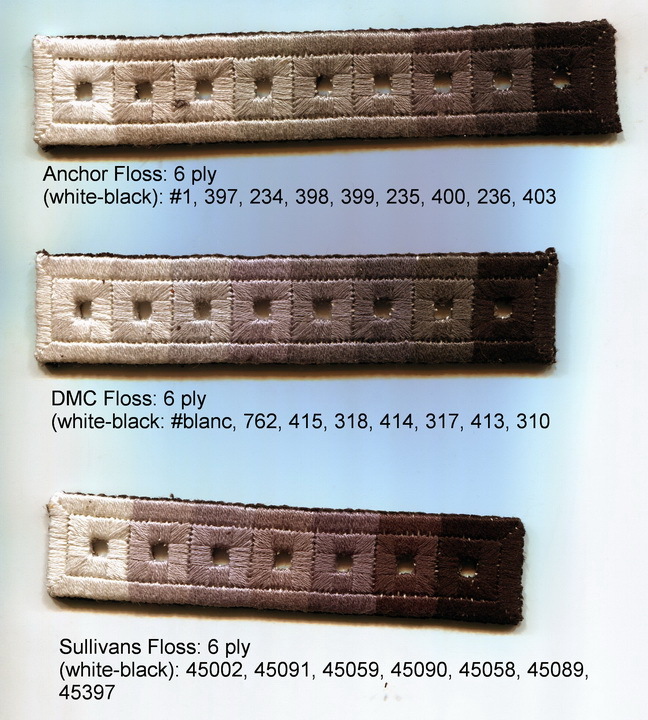 Sullivans Floss: 445002, 45091, 45059, 45090, 45058, 45089, 45397. Research: 100% premium long-staple Egyptian Giza Cotton. Research: Long staple Double mercerized, Color Fast. Research: 100% long staple Egyptian cotton, color fast, fade resistant. Label: 6 strand 100% Egyptian cotton. Color Fast. Made in China 8.7 yds. Circle with two dots: Dry medium heat (Note really did not find the actual symbol but found circle with 2 dots to mean medium heat. I thought this was very interesting, especially if you use 2 different flosses in the same design be sure and use the lower of the two settings recommended. Also I will tell you that when I was in St. Charles I saw a stitched sample of Finca threads that was reported to have been soaked in chlorine bleach for a long time and the colors had not bled nor faded. I personally would not try this on a finished work until I had personally experimented on my own…but I don’t plan on spilling anything either. I am a firm believer of food and drink not mixing with needles and thread. Or just google the symbol. I’m off to JoAnn’s to see if I can find a ribbon to finish my value scales and I hope to have these to show you first of next week. I love this quote…My heart just wishes my hands would work as fast as my head. I can wake up in the middle of the night with either a new idea…or an “ah-ha” moment for a problem that has been bugging me. I have learned that to try and maintain my sleep pattern, a notebook by the side of my bed helps. I just write down the thought and sometimes I can go back to sleep…and well yes other times I just give in and get up and “putz” around the house, computer, or stitching. (a nice lady once told me “putz”…it means “to do”; she also told me to “utz” someone was to give the a joyful dig or pun. So since “utz” is in “putz” I always take a second look at the “putzing” I have done in the wee hours of the day…I need no surprises…I can create those on my own with a good night’s sleep. And before I forget, Kurdy Biggs sent me a comment and she has posted the pictures of her tote and stitching book to her websight (http://www.threedles.com/06012011/2013/Pangea/Pangea_BagAndWallet.html) and even linked you to her finisher…Now I can go lust and drool over her finishing anytime. They are beautiful. Can’t believe August is over, seem like it just started a few days ago…but I did spend August organizing the color and design notebooks. I spent a good deal of time working on just sorting and getting myself more organized in the color and design notebook area ( don’t want anyone to get the idea I went over board and organized my life) These notebooks have long been neglected; they were sitting in the corner of the library just growing. This month I whipped them down to a manageable size…okay so I just cleaned them up a bit. 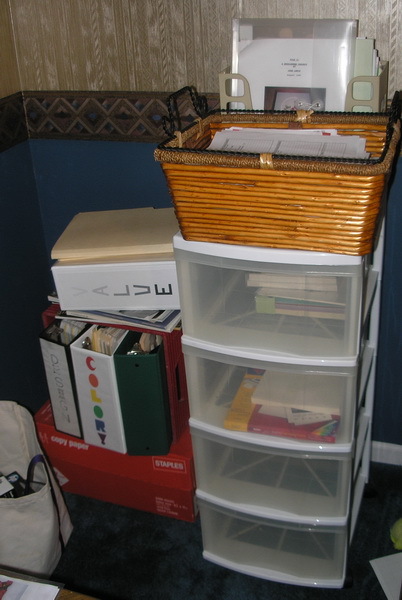 (I am also trying to convince myself that I am a packrat…not a hoarder…you can still walk through my library but it is filling up. 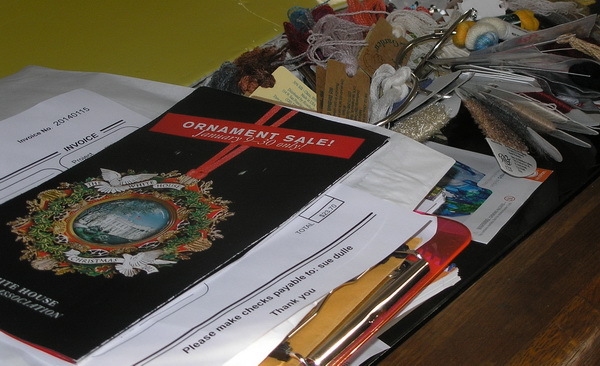 After a general clean-up of the growing color and design area I eliminated one computer box of stuff and several piles of growing “I may need this” piles; I feel like I have a grasp on this project now and I am committed to working on this project long term. When I was in teacher certification you were required to take adult education classes related to art…and this never hurts anyone…you’ll find a bunch at your local colleges and now even online (and in some areas if you are over 55 these classes are free or at least offered at a reduced rate). I was and am a sucker for a color class and so I signed up a few times in different medias…silk dying, watercolor, acrylic…you get the idea. The one thing that was consistent in all these color classes are the first thing they would talk about is value and most would also start with gray value system because once you understand the value system in grays then value of colors is easier. So I have started with my “The Value of Gray” notebook too. 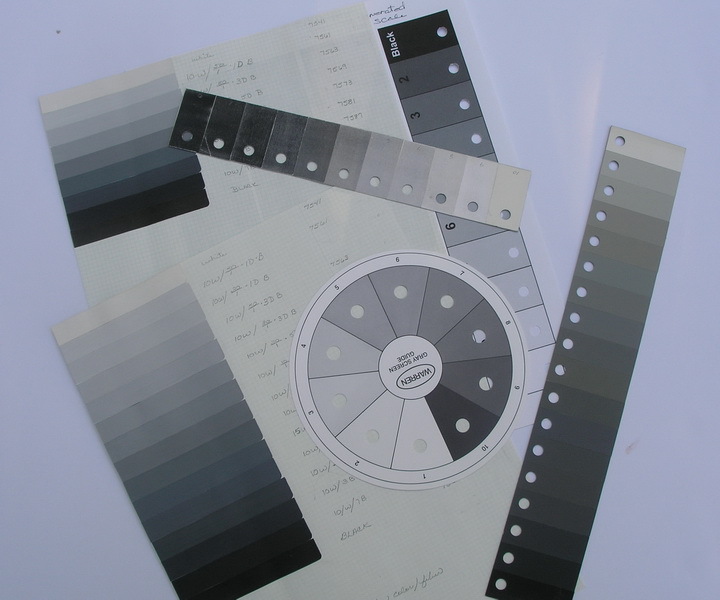 Notice I didn’t say much easier…gray values and even color are greatly influenced by the values or color used together (one color influeces another and this can be very frustrating), the light we live with and our very own color perceptions. My gray values may be warmer (more to the browns and greens) or cooler (more to the blues) than yours. I may see a different number of gray values between white and black than you do. A value scale can have many grays or just a few…a good number to strive for is: white, 5-9 values of gray, and black in your value scale. 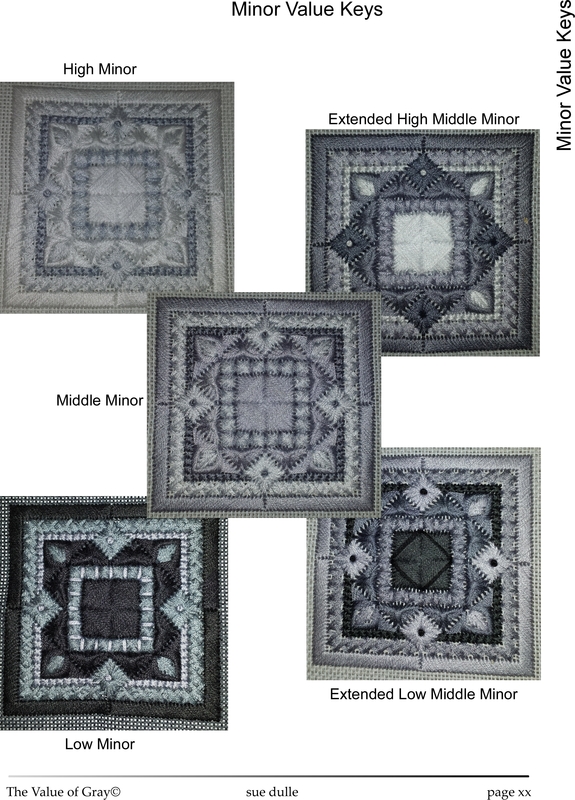 I took a picture of some of the value scales I have collected or made over the years, most have 7-9 gray values. 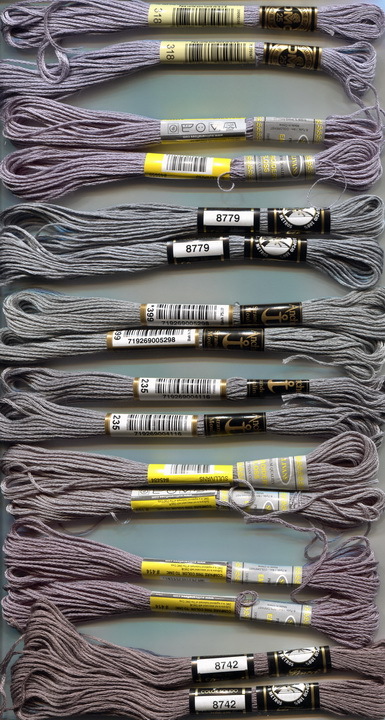 I have started to organize the gray notebook and even planned some of the exercises but not all the stitching exercises. I have folders in the back of the notebook with extra pictures I collect. I have started some of the exercises and have others at least written down. I have also collected the floss for this project and have taken pictures of the floss by brand as well as by color, even scanned the floss for better color clarifications. This month my goal is to get the gray notebook pretty much completed and ready for a pilot test. I’m off to gray stitch a value scale or two…Thank you for stopping by and I hope you have time to stitch today!